GLENDORA, Calif., March 20, 2018 – “We’re a leader. 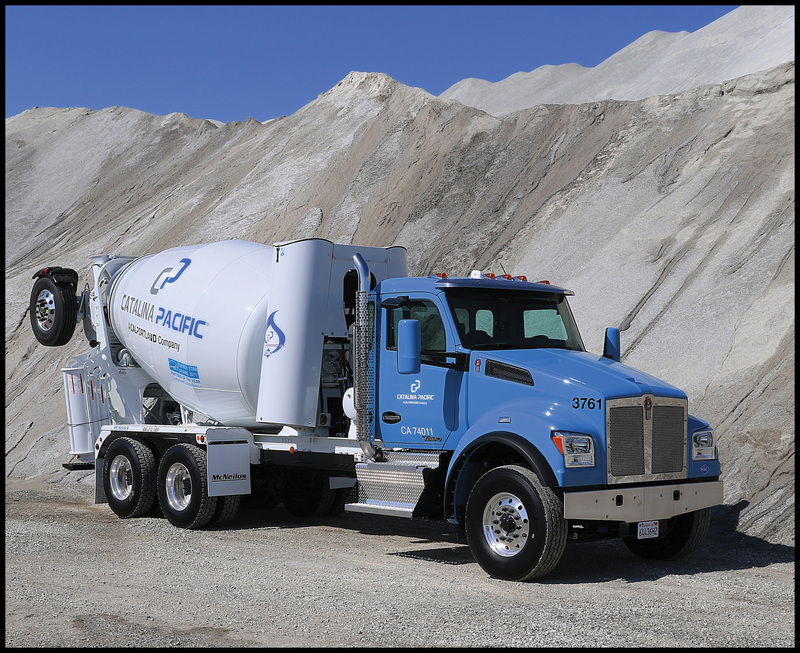 Not a follower.” That’s the matter-of-fact mantra Steve Mitchell has about CalPortland®, the oldest continually producing Portland cement company west of the Rocky Mountains. 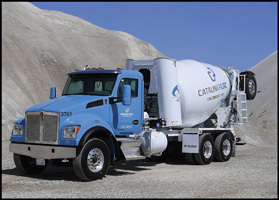 With nearly 4,000 pieces of equipment – which includes 1,300 mixers and 450 additional Class 8 units (dumps, flat decks, pneumatic, boom, water trucks, and others), as well as 205 medium duty trucks – CalPortland is also one of the largest. The company operates in five U.S. states and two Canadian provinces. Lead they do. CalPortland has been recognized by the EPA with the prestigious Energy Star Award for 15 years and 13 consecutive Energy Star Sustained Partner Awards for its environmental work. Creative? CalPortland built its own 24-megawatt wind farm to power its cement plant in Mohave, California – a plant that produces 1.2 million tons of cement annually. That vision works its way all the way to its trucks. Starting last September in California, Catalina Pacific®, a CalPortland® Company, began placing into service 118 new Kenworth T880S set-forward front axle mixers through NorCal Kenworth. The mixers use compressed natural gas (CNG) and are powered by the 8.9-liter Cummins Westport ISL G Near Zero NOx engine. The 320-hp mixers are outfitted with the 10-1/2 yard McNeilus Bridgemaster® Transit mixer body, and operate in five locations across the Los Angeles metro area. 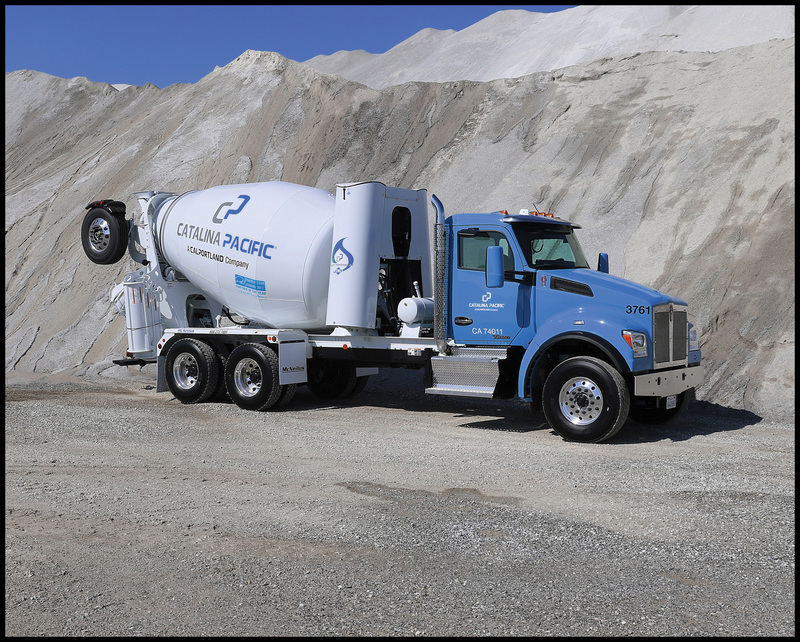 At two of the sites, Catalina Pacific®, a CalPortland® Company, installed its own CNG fueling stations – costing more than $1.3 million each. Kenworth trucks at the three other locations use public CNG stations for re-fueling. While the company is in its infancy when it comes to CNG, it’s very mature when it comes to running a fine-tuned operation with diesel power, and trucks configured to maximize payload. CalPortland was one of the first companies to place the Kenworth T880 into service. The first orders were configured as dump trucks. According to Mitchell, spec’ing gets challenging since each state has different weight regulations. “In California, we strip down to be as light as possible – 9-liter engines, lighter suspensions – we even take the passenger seat out. We can only haul 66,000 pounds gross, so every pound counts.” he said. “Our T880S CNG chassis weigh 15,854 pounds, while our diesel Kenworth W900S trucks come in at 14,000 pounds.